Which Medications Should I Take? What Medications Should Patients Take Before Surgery? At the UCLA BirthPlace in Westwood and Santa Monica, we know each birth is a deeply personal and special journey. 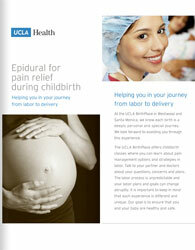 We look forward to assisting you through this experience.The UCLA BirthPlace offers childbirth classes where you can learn about pain management options and strategies in labor. Talk to your partner and doctors about your questions, concerns and plans. The labor process is unpredictable and your labor plans and goals can change abruptly. It is important to keep in mind that each experience is different and unique.Our goal is to ensure that you and your baby are healthy and safe. 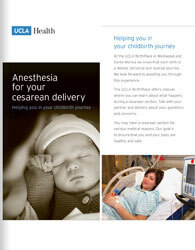 At the UCLA BirthPlace in Westwood and Santa Monica we know that each birth is a deeply personal and special journey. We look forward to assisting you through this experience.The UCLA BirthPlace offers classes where you can learn about what happens during a cesarean section. Talk with your partner and doctors about your questions and concerns. You may have a cesarean section for various medical reasons. Our goal is to ensure that you and your baby are healthy and safe.